Within our scooter shop in Dublin, we currently have a special offer on the Colt Deluxe mobility scooter. 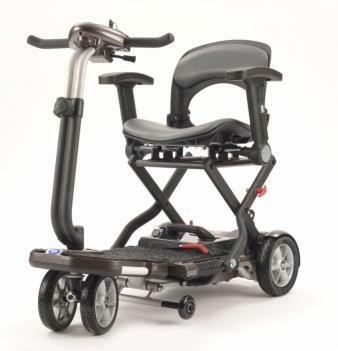 This modern scooter is considered sleek and sporty, with pristine front and rear suspension helping to make the performance much smoother and pleasant. Also included are high-visibility automatic brake lights, an easy to perform disassemble guide, LED kerb lights and a wraparound delta tiller. Within our Colt Deluxe range, we can also supply and fit a fully waterproof canopy so that you stay protected even in the cold, winter months. If you are interested in viewing any of our products before purchasing, feel free to visit our showroom within our Clane offices in Kildare. While you attend, we will be able to provide additional information about all of our goods, as well as host demonstrations of the scooters so that customers can view them in person. Due to our high demand, be sure to arrange an appointment so that you are able to receive dedicated support and assistance while you attend our facilities. As a business, we hold great pride in sustaining our exceptional reputation for our customer advocacy and reliability with each of the clients we work with. We also take our customer’s happiness incredibly seriously - which is why we always ensure our clients are 100% happy working with our scooter shop in Dublin. Our entire team are incredibly devoted to all the work they do and each have a wealth of experience in the industry - so you know we are the business you need to contact today. If you would like to make a purchase from our scooter shop in Dublin, please do not hesitate to get in touch today. You can call us on 01 616 7079, where our customer service team will be available to answer any questions, as well as address any concerns that you currently have. In order to book an appointment to visit our showroom, we are accessible to direct message via our website, where we look to reply within a single working day.